Heehee, I love this Twinsie Tuesday theme. 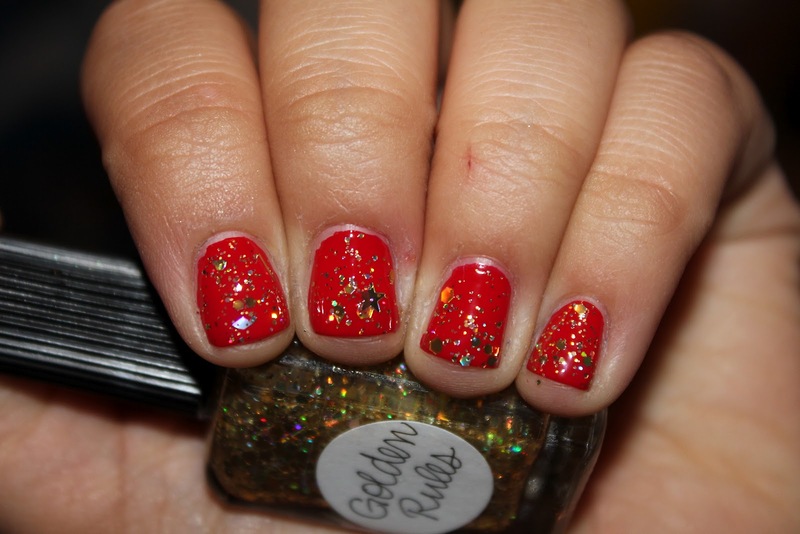 We did a secret copy cat mani from a random draw, I got Jenn from All That is Gorgeous! I wanted to recreate a recent mani she just did had, from Starry Earth: Lion of Valor :] I loved this mani on Jenn a lot, so I got out 2 of my polishes and tried to do my best to do it justice! How do you like my take on Jenn's gorgeous mani?? I'd kill for her nail beds, seriously. How perfect are they? Gah. nail bed envy. Is that a thing? It is now. 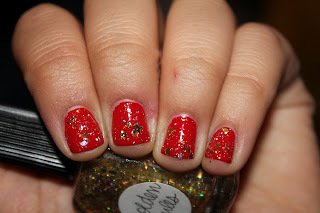 Anyway, this is 2 coats of Zoya Sooki [which was a definite surprise love for me] and Lynnderella Golden Rules. 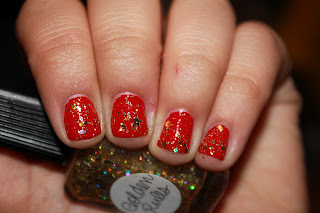 Other than the stars, I think my take on Jenn's mani has the same feel! Oooo, this is really pretty! Jenn has AMAZING nail beds! This looks pretty! Haha! You are so funny, Sarah! I have never noticed that my nail beds were anything special or nice! LOL! You are too sweet! I love your recreation!!! I am super duper in love with Sooki!!! Isn't it just a dream?? This is such a pretty mani. The red base and gold glitter are so perfect for each other.